Here are a couple of brand new shots of my seedlings…I took them tonight! You can see the glow of the grow light off to the left. 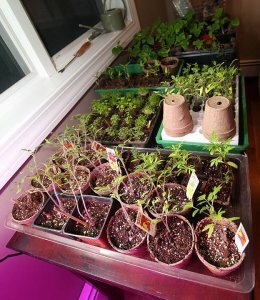 I’ve up-planted 60 seedlings to larger pots. There are still a good number in the bio dome, and I’ve started a second round. They’re getting about 12 hours under the grow light per day. I’m going use companion planting principles this year to help control pests and improve yields because I’d like to stay organic. This means I’ll need to build new beds. Which in turn means that I need to procure about 2 carloads of vermiculite. Good thing it’s a long weekend! I’d like to get the beds ready so I can possibly start some cool weather crops. I’m also thinking about building a cold frame, but there’s so much to do and too little time! Wow, you’ve got a little forest coming along! I bought a grow light to hopefully get my second try growing. Have fun planting all those babies!